Every year I attend several parties that host a “fun” gift-exchange game. I bring a $5-$15 wrapped gift and put it in a pile along with everyone else’s offerings. Then I get to unwrap a $5-$15 gift that someone else brought. Yay! Or not. OK, I get that Christmas has turned into a holiday of consumer-driven madness. And hey… I’m a shopper. I even get paid to write about shopping! So I’m not going to go on a rant about how wrong it is to buy, buy, buy during the holidays. I like presents. A lot. But I hate the give exchange game. Because what can you buy for $15? Not much. Gather everyone together in a circle. Make three piles of gifts: one pile for female gifts, one for male gifts and one for gender-neutral gifts. The lucky recipient of number 1 unwraps a gift and holds it up for all to admire. Number 2 can either unwrap a gift or steal number 1’s gift. I think the original idea was that you’d bring something so fabulous that everyone would want it and people would fight over it. Because nothing brings out the holiday spirit like cousins scrabbling over a $10 flashlight. But honestly? The mad-dash escapade of stealing and swapping gifts rarely happens because no one really cares that much. The quality of the gifts vary, but I’ve only ever once brought home a gift I truly wanted and enjoyed. This little gem is still in its original packaging because I thought maybe I could re-gift it. But you know what? None of my friends are even remotely this tacky. I actually wiped dust off of it to photograph it for this post. 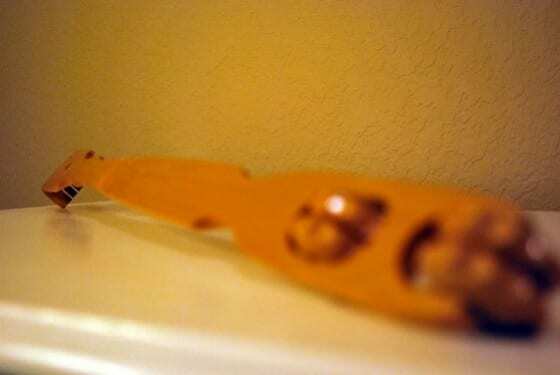 Nice backscratcher, huh? It came with some rose-scented lotion, which I threw out because I’m allergic to most highly scented products. And also? I don’t like to smell like an 80-year-old grandma. 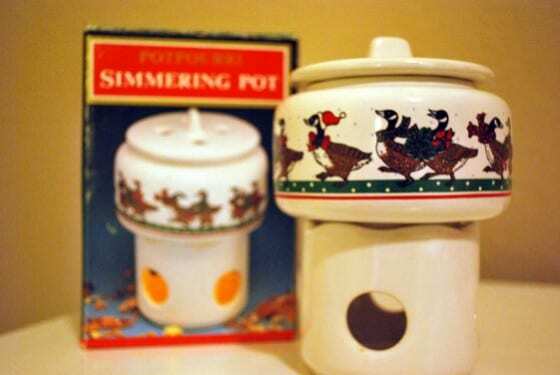 Nothing says “Classy Christmas” like a simmering potpourri pot with geese on it. But not just any geese… these festive geese are wearing scarves! I kept the box, with the intent to re-gift. Sadly, I have no friends who love Christmas scarf-wearing, geese emblazoned simmering pots. Seriously. I either need to get some different friends or learn to take stuff to Goodwill. A little stuffed Christmas bear! 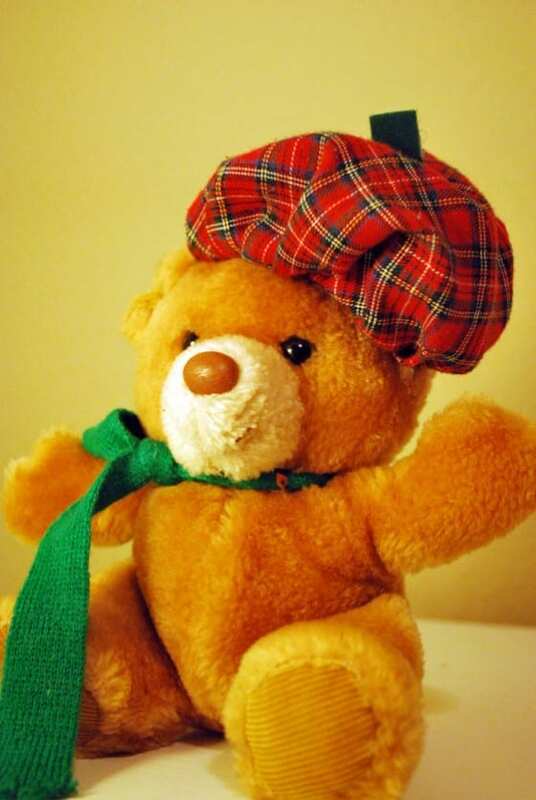 Oh he’s just so cute with his little plaid beret. C’est magnifique! What does one do with a bear such as this? Put it in the Christmas decoration bin year after year, in hopes that someday someone will pull him out and know what on earth to do with him. So here he is. Finally he’s found a purpose… he’s provided me with another photo of what not to buy for a gift exchange present! This is a non-photo of the Hillshire Farms sausage, tin of cookies and 2-liter bottle of soda I received one year. I ate it. All. I guess I could have inserted a copy of a recent echocardiogram, instead. Merry Christmas! Enjoy this sugar, fat and salt… and heart disease. This is the one gift I really loved receiving. And guess how I got it. I cheated. Yup. I bought this book (which I’d been admiring and coveting for weeks), wrapped it and brought it to the party. Then I innocently picked it up out of the pile, unwrapped it and tried to look surprised. “Look! 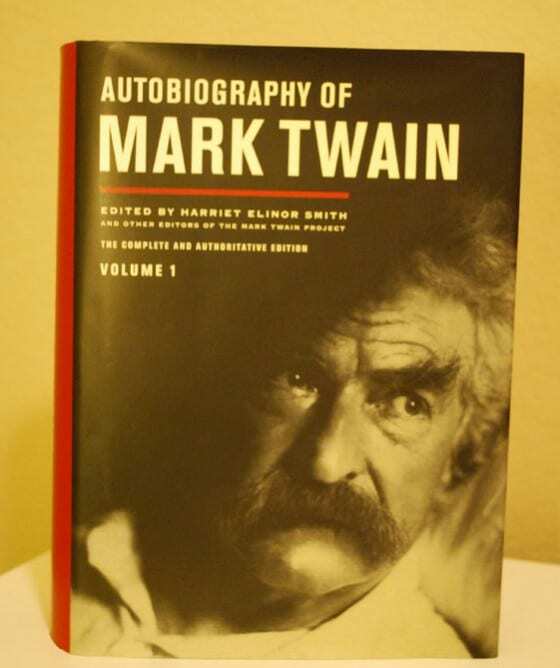 A 760 page autobiography of Mark Twain! My, my, my… I hope no one wants to steal this from me!” Guess what? No one did. My family is not so literary minded. Ha! Two of the parties with gift exchanges are family affairs. We’re required to bring a gift for each person. For my family of five, that means $75 worth of generic $15 gifts. For each party. Now I may have majored in English, but even I can do that math… $150 of gifts that no one needs or wants. In return, we go home with $150 worth of gifts (see photos above). $150! What does that kind of money buy? Last year, I decided to be the family rebel. I bought 10 small boxes of chocolate and 10 small plastic toy goats. I wrapped them up and took them to the two family parties. The lucky recipients of the gifts we brought got a little treat and a note, telling them that we had donated goats through Oxfam. I think that perhaps they were less than thrilled. But I’m told that Christmas is more about giving than receiving. And I sure did love giving goats! Oxfam is just one organization that offers this unique gift idea. You can go online and “shop” for farm animals, gifts of education, emergency essentials, even a fully-dug well for a community. The goodies go to third-world countries where needy families receive the gifts, along with education and assistance. Goats in particular are nice gifts. They are hearty little creatures who can eat just about anything. They provide milk (and cheese) to families who need the protein in their diets and also sell excess milk to earn extra cash to buy other stuff. Do We Need More Stuff? My family is lucky. Everyone is working, has enough food and a warm, cozy house. We don’t need another $15 trinket to make us feel like we’ve had a merry Christmas. If we must have a gift exchange, then let’s exchange virtual goats. Or chickens. Or oxen. Because there are people in the world who don’t have jobs, food or nice houses. So if you’re a member of my family, you should know that the red gift bags with the snowflakes contain tiny plastic toy goats and Whitman’s 6-piece chocolate samplers. 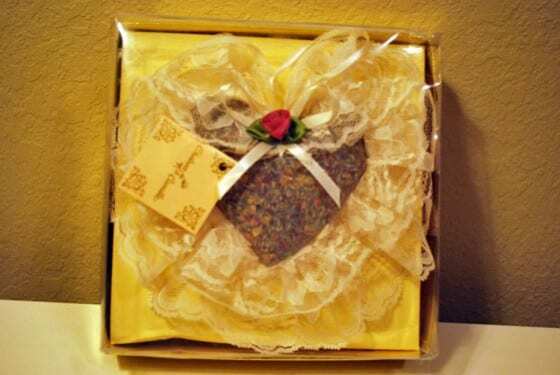 If you want a lace potpourri sachet or a wee, beret-wearing bear, you might try a different package. Merry Christmas!